Status of Waterway Ridges as at 13 May 2012. Photo taken on 13 May 2012. 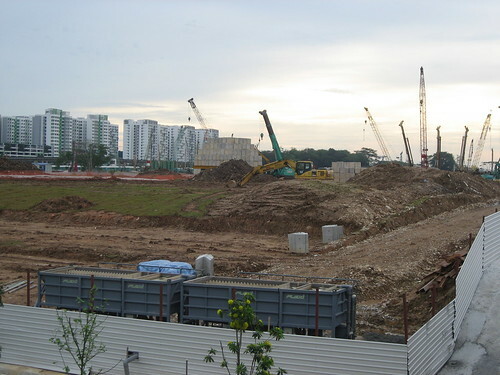 The exact location of Waterway Ridges is along My Waterway@Punggol. On the left is the New Road Extension of Edgefield Plains and on the right is the Water-Inlet directly opposite the Oasis Lrt Station. The development consists of 224 units of 3 room flats with a floor area of 65 sqm @ $188,000 to $229,000 per unit. 4 room flats ( 362 units ) with a floor area of 87 to 90 sqm @ $257,000 to $359,000 per unit. 5 room flats ( 246 units ) with a floor area of 110 sqm @ $351,000 to $445,000 per unit. The Blocks range from 6 storey high to 18 storey. A bridge will be constructed over the Waterways along New Road Extensions to Edgefield Plains. 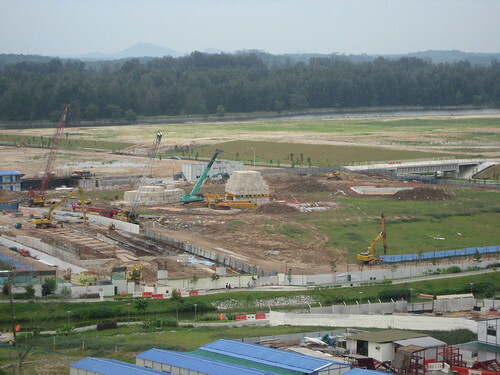 At the moment, heavy building equipments were at site working on the bored piling systems.